London 2012 has reached paradigmatic status for the way that it organised the Paralympic Games and sought to leverage its legacy potential. 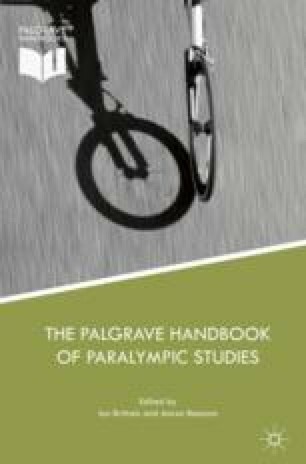 Beginning with an analysis of London 2012’s bid, the chapter then examines the position and role of key stakeholders including the organising committee, the UK government, corporate sponsors and Channel 4, the television broadcaster. The degree of Paralympic integration and engagement justifies London 2012’s ‘Paralympic’ paradigmatic status. This being said, a number of Paralympic issues, challenges and risks that London 2012 faced are noted. A discussion of London 2012’s attempt to create a ‘lasting legacy’ concludes the chapter. Tonight is a celebration of the development of the human spirit, a celebration of the Paralympic movement coming home and a celebration of dreams becoming a reality. AIB. 2012. 2012 AIBs Winners and Highly Commended. http://theaibs.tv/2012-aibs-winners-and-highly-commended/. Accessed 4 June 2015. Brittain, I., G. Ramshaw, and S. Gammon. 2012. The Marginalisation of Paralympic Heritage. International Journal of Heritage Studies. https://doi.org/10.1080/13527258.2012.681679. CAS. 2008. Arbitration CAS 2008/A/1480 Pistorius v/IAAF, Award of 16 May 2008. http://jurisprudence.tas-cas.org/sites/CaseLaw/Shared%20Documents/1480.pdf. Accessed 4 June 2015. Grant Thornton, Ecorys, Loughborough University and Oxford Economics. 2012. Report 4: Interim Evaluation Meta-Evaluation of the Impacts and Legacy of the London 2012 Olympic Games and Paralympic Games. http://doc.rero.ch/record/31881/files/Report_4.pdf. Accessed 5 June 2015. IPC. 2008. Beijing 2008 Paralympics on NBC Sports. http://www.paralympic.org/news/beijing-2008-paralympics-nbc-sports. Accessed 4 June 2015. ———. 2012a. IOC and IPC Extend Co-operation Agreement Until 2020, May 8. http://www.paralympic.org/news/ioc-and-ipc-extend-co-operation-agreement-until-2020. Accessed 10 May 2012. ———. 2012b. London 2012 Overview. http://www.paralympic.org/london-2012-overview. Accessed 4 June 2015. ———. 2012c. USA Announces NBC Broadcast Plans for London 2012. http://www.paralympic.org/news/usa-announces-nbc-broadcast-plans-london-2012. Accessed 4 June 2015. ———. 2013. NBC Highlights Handful of New Paralympic Broadcast Deals. http://www.paralympic.org/feature/no-1-nbc-highlights-handful-new-paralympic-broadcast-deals. Accessed 4 June 2015. ———. 2014. 7: First IPC-IOC Agreement. http://www.paralympic.org/feature/7-first-ipc-ioc-agreement. Accessed 4 May 2015. The Guardian. 2012. Olympics 2012: Every Record Broken at London 2012 Listed, August 10. http://www.theguardian.com/sport/datablog/interactive/2012/aug/10/olympics-2012-list-of-records-broken. Accessed 4 June 2015. UN. 2015. Convention on the Rights of Persons with Disabilities. https://www.un.org/development/desa/disabilities/convention-on-the-rights-of-persons-with-disabilities.html. Accessed 8 March 2017.